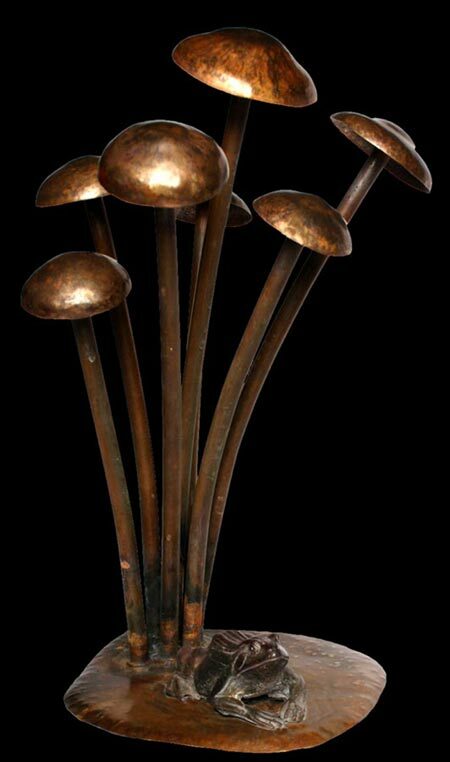 A cluster of seven hand beaten copper Toadstools provide shelter to the cast Lead Frog sitting below. This sculpture is designed to be displayed outside in the garden. Copper and lead will naturally oxidise outside in the elements and as such, will change in appearance over time. You can expect the copper to darken to a walnut brown and tinges of verdigris green will appear over time. The lead frog will develop areas of white, lead oxide. These will only enhance its appearance and highlight detail. Both the lead and the copper oxide, will actually protect the surface from corrosion and ensure that that your sculpture will last a lifetime. No maintenance is required.